Having grown up in Texas, I have no childhood memories of snow. But I do have memories of reading Calvin & Hobbes comics, and this scarf reminded me of their snowball fights, hence the title. 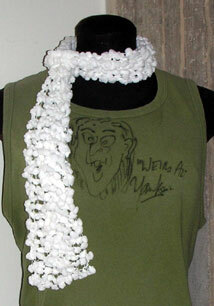 This scarf is the perfect accessory for all your autographed "Weird Al" Yankovic t-shirts. 64" long. A single ball of this yarn will make either two scarves 2.5" wide (as shown) or one scarf 5" wide. Cable cast on 7 sts for the 2.5" wide scarf or 14 sts for the 5" wide scarf. Knit every row until you reach 65". Bind off loosely. - Remember to use the cable cast on method, where you knit the stitches onto the needle. The regular long-tail cast on method will not work with this yarn since the balls prevent it from sliding through the loops. - It may take a while to get comfortable knitting with this yarn. 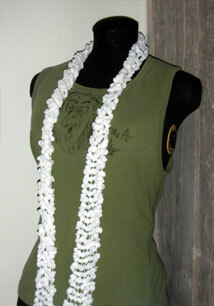 If you have too much trouble with it, try carrying a strand of regular white yarn along with it. - It might help to treat this yarn as if you were working with beads. The scarf will look best if you make each ball sit on a purl bump on the back of your knit stitch.